This image illustrates skin healing after a minor injury. 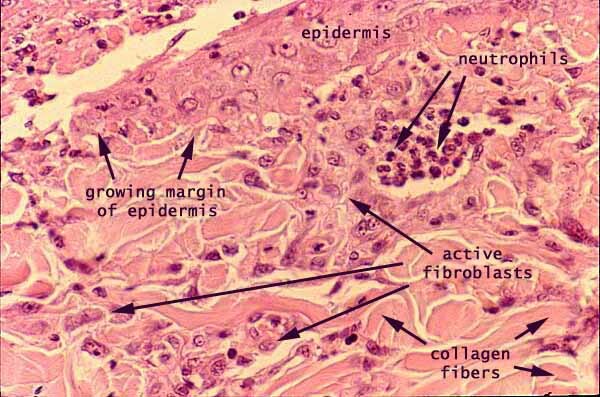 Note the obvious epithelial quality of the newly-formed epidermis, even though well-developed layers have not yet appeared. Note that active fibroblasts have more evident cytoplasm and more euchromatic nuclei than the resting fibroblasts encountered in most normal skin preparations. Also note that the collagen fibers in this region of scar formation are larger than typical for papillary dermis. And note the nest of inflammatory cells (neutrophils) which reflect a recent history of inflammation triggered by the injury and possible contamination. The context for this view may be more easily appreciated at lower magnification. Return to the previous window, or click on one of the adjacent thumbnails.